Special Features: Ella's Furry Friends - Discover how the movie’s animal stars honed their memorable performances. "Have courage and be kind, my darling." At their core, most classic fairy tales are inherently old-fashioned, adhering to traditional tropes and concepts related to heroism, morality, and gender roles. But while not all of these aging conventions remain particularly fresh when placed within the evolving context of 21st century society, old fashioned doesn't have to mean obsolete. In fact, if Disney has anything to say about it, old fashioned can still mean captivating, enchanting, and downright magical. With the studio's latest take on 'Cinderella,' the filmmakers resist the urge to radically modernize or reimagine the original story, revealing why its timeless themes and delightful fantasy continue to be relevant. Based on the famous fairy tale, and heavily influenced by the 1950 animated classic, the narrative focuses on a good-natured young woman, Ella (Lily James), who is cruelly mistreated by her wicked Stepmother (Cate Blanchet) and stepsisters after her father passes away. When the Prince (Richard Madden) holds an extravagant ball for all of the eligible maidens in the kingdom, poor Ella is forbidden to attend, relegated to nothing more than a servant in her own home. But after her Fairy Godmother (Helena Bonham Carter) appears, Ella is given a magical opportunity to change her life. Though Disney has recently enjoyed great success with progressive fairy tale offerings like 2013's marvelous 'Frozen,' here the filmmakers opt to go for a much more traditional experience. With that in mind, the narrative remains remarkably similar to previous incarnations of the story and the script hits all of the well-known beats without any notable deviations. Likewise, though certain characterizations are elaborated upon, the central plot remains quite simple and straightforward, eschewing any attempts at irony or revisionism. Thankfully, this old-fashioned approach also proves to be refreshingly sincere and heartfelt, playing up the story's timeless themes while delicately tweaking certain elements that haven't aged quite as well. To this end, Ella becomes a more active protagonist here than in many previous takes on the material, and the script's approach to the central romance is more even-handed. Instead of a girl hopelessly waiting for her "Prince Charming" to merely sweep her off her feet, here the characters' coupling feels more balanced. Hell, as depicted in this version, the prince might actually be the one truly swept off his feet, as he is just as smitten by Ella as she is by him, and we might even spend more screen-time with him pining over her than the other way around. Likewise, the pair actually share believable and rather sweet chemistry, further helping to sell their romance. Yes, the climax still features the classic slipper, but the groundwork that gets us there makes it feel like both characters have struggled toward finding and fighting for each other. Lily James and Richard Madden (The King in the North!) sparkle on screen together (sometimes literally), and both bring genuine emotion and personality to their fairy tale archetypes. Cate Blanchet also turns in a memorable performance as the icy Wicked Stepmother, and despite the role's inherently villainous nature, the actress mostly resists the urge to ham it up too much. The same could also be said for Helena Bonham Carter's Fairy Godmother, who is appropriately quirky without resorting to Johnny Depp levels of Disney-funded eccentricity. Don't get me wrong, the runtime is still filled with comparatively broad and simple characterizations, but the actors bring a certain level of emotional honesty and depth to the fantastical drama that helps to avoid the forced quality found in many similar efforts. This surprisingly sensitive air can be largely attributed to Kenneth Branagh's elegant and earnest direction. With a deft hand, the veteran filmmaker imbues the movie with a clear passion for the prevailing magic of fairy tale storytelling. Though some of the CG work can be a bit dodgy, the visuals are quite enchanting throughout, filling the screen with gorgeous production designs, striking costumes, elaborate sets, and painterly compositions. The pumpkin carriage transformation scene and the ballroom dance both prove to be especially beautiful set pieces. The latter sequence also features some rather lovely camera work, with gliding movements that make it seem as if the characters and camera are dancing together. Much like the title character's own shimmering shoes, Branagh's Shakespearian sensibilities end up fitting the film's whimsical tone perfectly. Sweeping, graceful, heartwarming, and grand in all the right ways, this latest take on 'Cinderella' is a simple yet joyous cinematic fairy tale. Through its themes of kindness and courage, the movie offers a timeless story about love overcoming cruelty. Tastefully old-fashioned without ever feeling truly outdated, the film proves that fairy godmothers, pumpkin carriages, and glass slippers still have plenty of magic left to share… that is, so long as it's before the stroke of midnight. 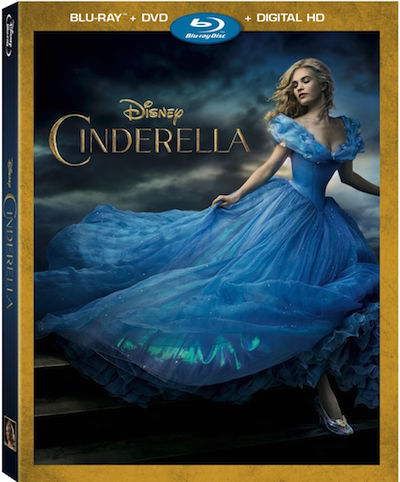 Disney brings 'Cinderella' to Blu-ray on a single BD-50 disc that comes housed inside a keepcase. A separate DVD and instructions for a Digital HD copy are also included. After some skippable trailers, the disc transitions to a traditional menu screen. The packaging indicates that the release is region, A, B, and C coded. Ella's Furry Friends - Discover how the movie’s animal stars honed their memorable performances. The movie is provided with a 1080p/AVC MPEG-4 transfer in the 2.35:1 aspect ratio. Full of sumptuous colors and magical imagery, this is an exceptional video presentation. Shot on 35mm film, the source is pristine, with a very light layer of natural grain. Clarity is fantastic, highlighting all of the sparkling costumes, intricate set decorations, and magical pumpkins with sharp detail and gorgeous dimension. Colors are absolutely stunning, offering lush hues marked by a heavily blue, yellow, and green palette that pops from the screen with storybook saturation that remains rich without ever bleeding. Contrast is balanced well with bright whites and solid shadow detail. With that said, black levels do appear just a tad elevated, leading to a faintly washed out look in dark sequences. Likewise, there is a hint of banding during a few fades and very minor shimmering. Beautifully shot and free from any major technical problems, 'Cinderella' comes to Blu-ray with a magnificent transfer that should enchant viewers of all ages. The film is presented with an English DTS-HD MA 7.1 track along with English SDH, French and Spanish subtitles. Marked by lively whimsy and layered design work, the mix effortlessly brings the movie's fairy tale world to life. Speech and narration are clear, clean, and perfectly balanced throughout. From the moment the film's idyllic opening scene hits the screen, the soundstage brims with activity and storybook atmosphere, spreading chirping birds, squawking geese, and galloping horses around the room. Directionality is precise and smooth with natural imaging and lively surround use, creating varied and convincing settings that extend layered effects work far beyond the edges of the frame, bringing an extra sense of personality to the movie's bustling markets, peaceful meadows, majestic castles, and extravagant balls. Key sounds, like exploding fireworks and a twirling magical wand offer some particularly immersive moments, and a chase scene brings some aggressive low frequencies into the mix as well. Dynamic range is wide and distortion free, and Patrick Doyle's rousing score comes through with stirring fidelity and separation. Though not quite 5-star worthy, this is an enveloping track full of magical personality and seamless design work. Disney has provided a solid collection of supplements, including a few Blu-ray exclusive featurettes and a wonderful 'Frozen' short film. All of the extras are presented with 1080p video and Dolby Digital 2.0 audio (unless noted otherwise). Ella's Furry Friends (HD, 4 min) – This featurette focuses on the real life animals used in the movie. Frozen Fever (HD, 8 min) – Presented with DTS-HD MA 7.1 sound, this is an amusing short film that features characters from Disney's 'Frozen' as they attempt to celebrate Anna's birthday. 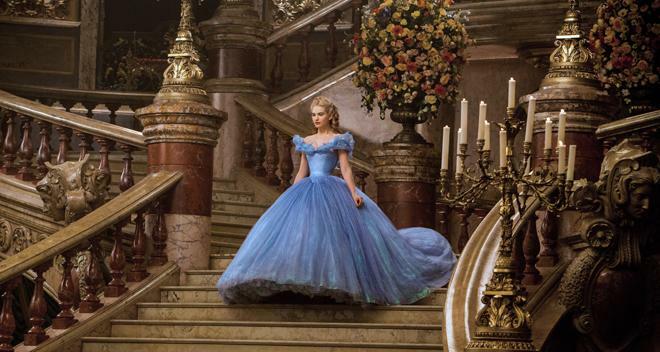 Kenneth Branagh's 'Cinderella' is an enchanting and sweeping cinematic fairy tale. Though unashamedly old-fashioned, the movie plays up all of the right beats from the classic story, resulting in a timeless and magical experience for all ages. The video transfer and audio mix are both spectacular, providing an immersive and mesmerizing technical presentation. Supplements are a little light, but there are some solid insights in the included featurettes, and the 'Frozen' short film is very entertaining. This is a lovely release for a lovely movie. Highly recommended.